Emerald – the name is derived from the Greek World ‘smaragdus’ or ‘smaragdos’ meaning green! The beautiful emerald ranges from yellow green to blue green. Whereas the color green itself symbolizes growth, life, renewal, regeneration, the touch of blue lends some mystery, some peppiness to it. And its intermixing with yellow tones it down to be more earthy and soothing. Emerald is the ruling color for the year 2013; all apparel, accessory and furnishing and jewelery designers racing to include it in their collection. Some are going all the way green emerald , whereas some are trying to use it as an accent color. Becoz emerald all the way in a big sheet or a huge wall can be too overbearing. Emerald is also being referred to as ‘the stone of Venus’. It is primarily a green variety of beryl, a mineral which comes in many other colors, that are sometimes also used as gems, such as a blue aquamarine, yellow heliodor, pink morganite and colorless goshenite. 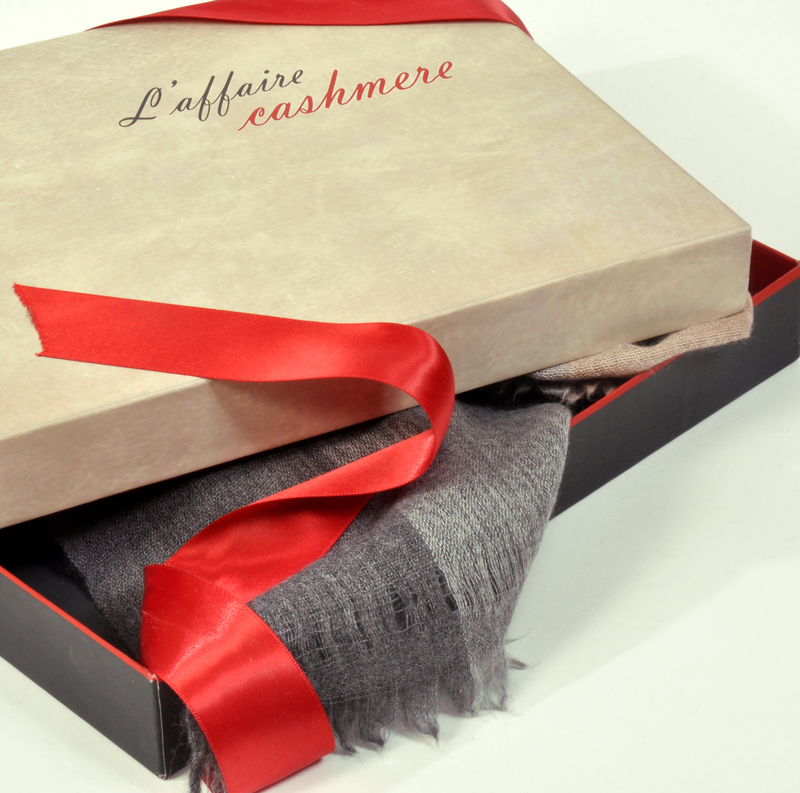 Check out the spring/summer colors on http://www.laffairecashmere.com…….there are limes, salmons, white based animal prints, ice blues and greens. 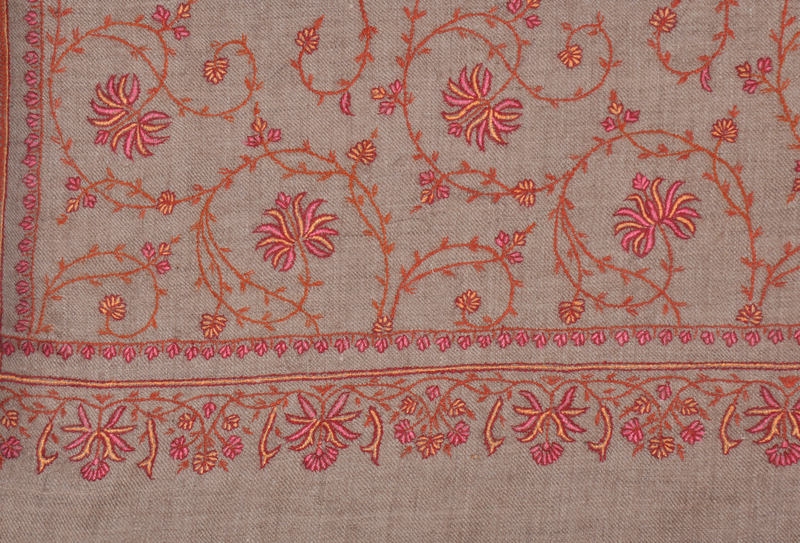 The fine pashmina shawls have been adorned with hand embroideries since long. 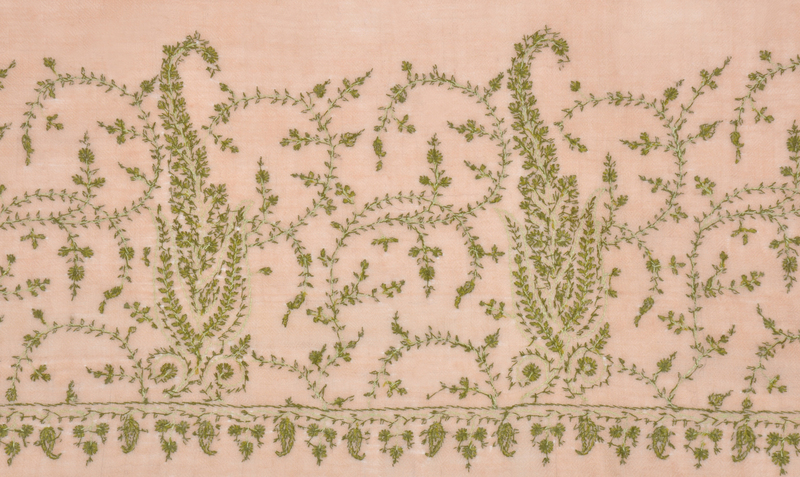 Ever since the 17th to 18th centuries to date, the motifs used in embroideries have not changed too much. As pashmina shawls are a true classic by themselves, treasured by women for their own use or to be handed down as pieces of family heirloom; so the embroidery motifs also have something perennial about them. 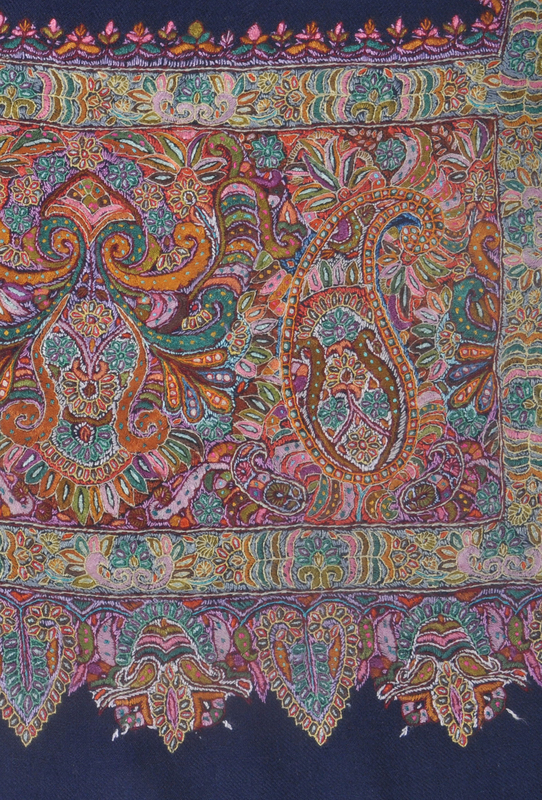 The motifs of paisley or ‘amb‘ and a typical flower shape or ‘butah‘ are as charming as before! 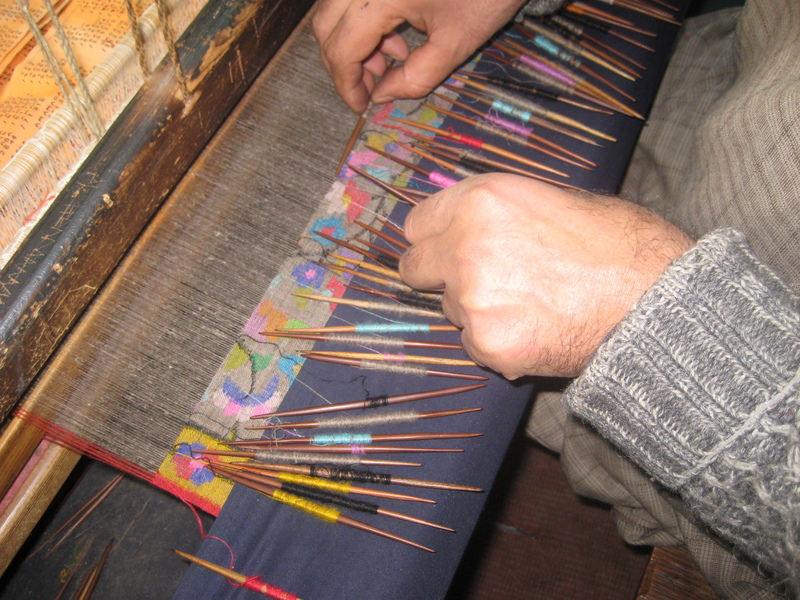 To begin the process of embroidery, the shawl piece is already dyed but not washed or softened. A tracing of the pattern with perforated lines is set on the prepared piece and a fine powder in contrasting color is rubbed through the perforations. This powder is easily washable when the work is done. Second method is through imposition of design with help of wooden carved blocks. 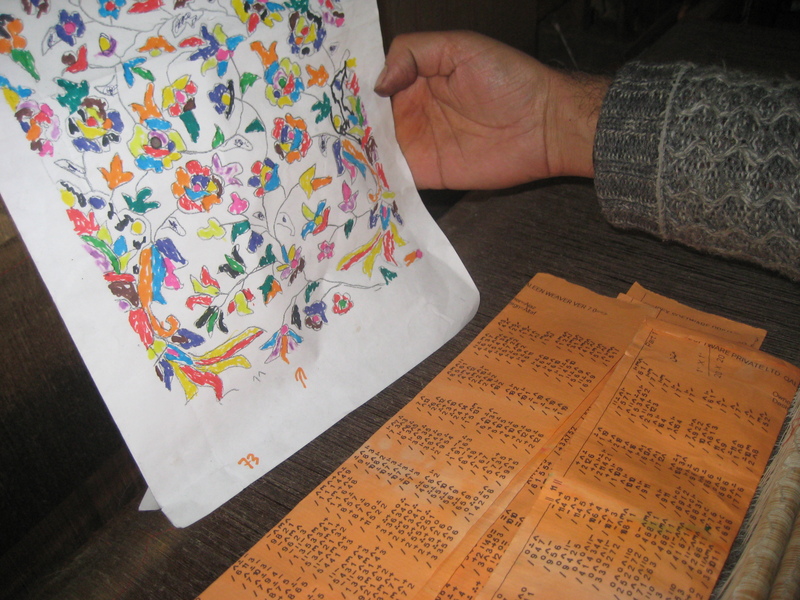 The blocks are dipped in fugitive colors and placed at strategic points as per the design.. Often the scattered embroidered motifs are achieved with help of wooden block prints and the borders etc.employ the former technique of perforated tracing paper. During the 18th and 19th centuries, the ‘kani‘ design and the ‘amlikar‘ shawls were quite famous. In ‘amlikar‘ pashmina shawls, the embroidery person used pashmina yarn to embroider the design, which mimicked the true ‘kani‘ design shawl. 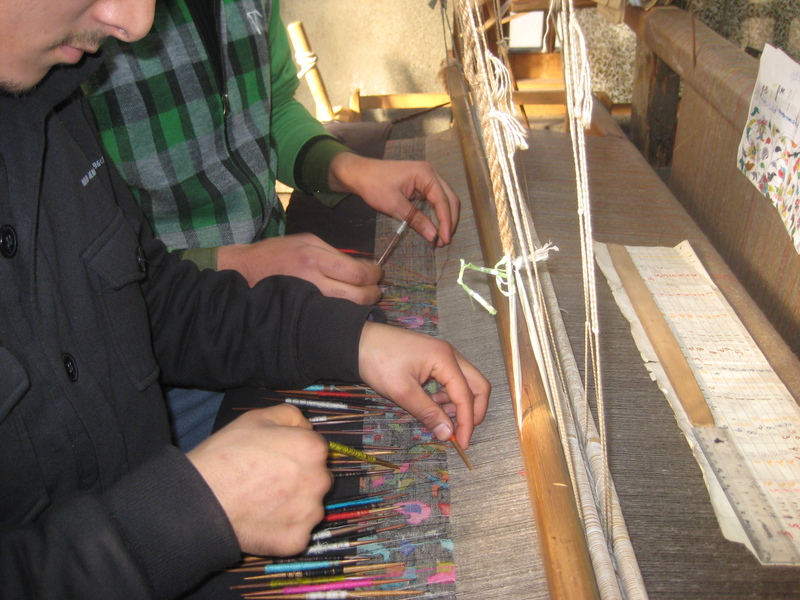 As we know that the ‘kani‘ design is a more painstaking technique, wherein the craftsman uses many a colored bobbins simultaneously to weave the wonderful motifs at the time of weaving the shawl only. Today the ‘kani’ technique is still intact; it is prized by patrons of good hand work in west as well in east. 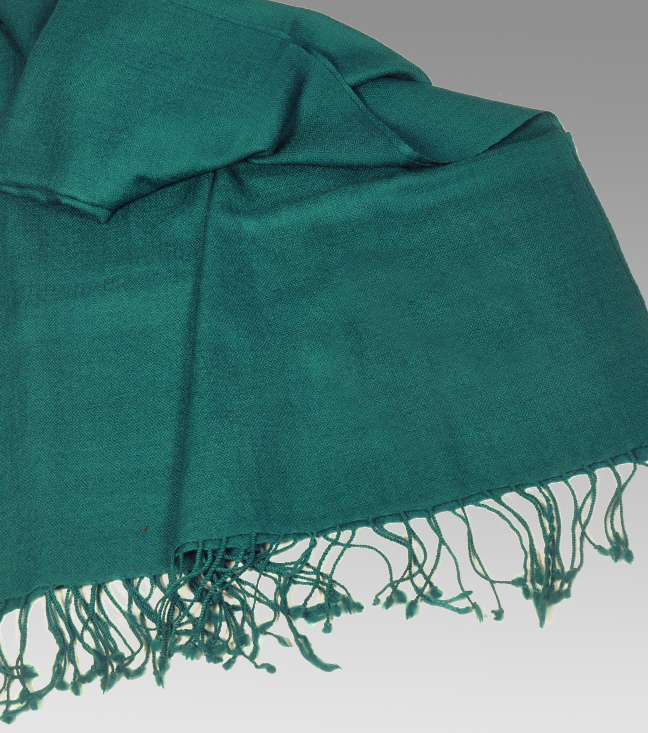 Though the term ‘amlikar‘ shawls has vanished. 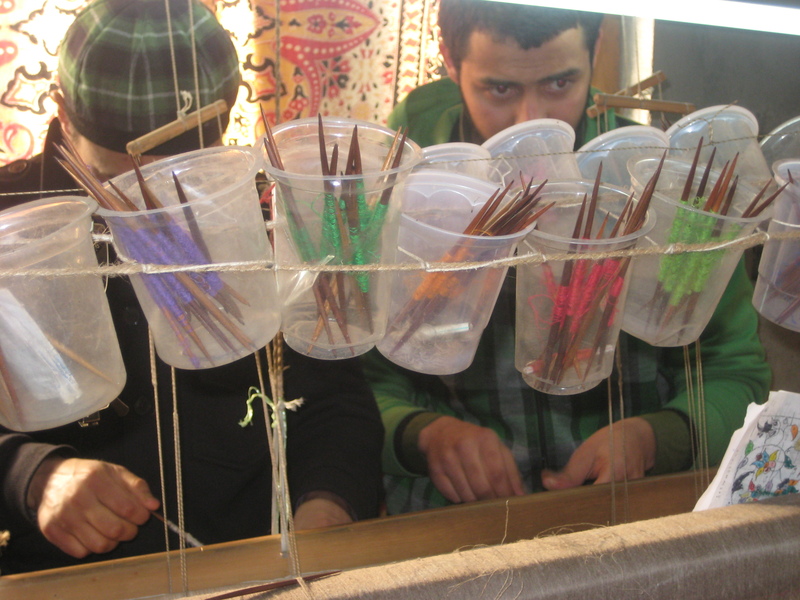 The art of fine embroidery used on cashmere and pashmina shawls is called ‘sozani‘ today. The art of ‘sozani’, which has evolved over the time employs a wide variety of stitches e.g. darning, double darning stitches, running stitch, buttonhole stitch, stem stich, satin stitch and herringbone stitch,and knot stitches. Also under the art of ‘sozani‘ embroidery, a few craftsmen use couching, which is actually a imitation ‘kani‘ stitch; a stem stitch reinforced by a very fine couching stitch. Another feature, which sets Kashmiri ‘sozani’ apart from other embroidery traditions is the use of scissors to cut off the loose ends at the back. This feature gives a clean look at the back of a pashmina shawl or wrap. Soak in the romance of luxurious embroidered cashmere and pashmina shawls! Gift is……….…… Love and Care Wrapped! Enjoy Gifting, for the joy of Giving is more than the joy of Receiving! Buying gifts is an art, which some people become good at and while others end up buying most expensive and least appreciated items. Giving gifts whether to business or personal friends is a social norm, which should be done with due consideration. Different cultures of the world have different traditions attached to it. In many cultures including that of Japan, the receiver is supposed to open the gift politely in presence of the giver and appreciate it. In many traditional societies, like India, you are not supposed to show your eagerness to know and see the contents of the gifts; you may thank the giver later. Interestingly, many organized and successful people keep a track of the gifts, lest they repeat a gift or worse still give their business associates and friends back the very same item received from them as a gift!! There are many considerations while buying gifts e.g. whether it is for your boss, colleague, neighbor, childhood friend, spouse, children or a recent acquaintance. Also the occasion counts to a great degree whether you are going to a house warming party, birthday party, wedding or a meeting a friend after long years. A wedding gift is supposed to be more sumptuous than the one given on a casual get together. A special milestone birthday or a silver jubilee wedding celebration or a great boss and colleague going away call for a little more elaborate and thoughtful gift. You have to have some budget in mind. That narrows down the million choices in the universe to a few automatically. While it is always true that it is love and care that goes into choosing a gift, there is practical aspect to it also. If, however, money is not a constraint, you still need to know as to what maximum you are willing to spend on it. Then think from that person’s viewpoint for whom you are buying a gift . What he/she loves, e.g., sports, makeup, latest fashion accessories, books, cooking . Did they ever mention as to a particular item they wanted to buy, a concert they wanted to see or a destination they wanted to visit. If you had listened to them carefully, you can play the record in your mind slowly and that should give you an idea. Always give what the other person will love, not what you would love him/her to wear, to read etc. In case of children, you may try giving something ( a book, a sports item), where you want to nudge them gently in that direction. But as my experience goes with my children, it has some success only till they are teens. A teenaged child has more fastidious choices than an adult! It is more in fashion now to gift a holiday, tickets to a concert, spa package than the usual choice of gifts. Last of all, most expensive gift is not necessarily the best gift. A gift chosen with love and care, packed aesthetically with personalized message, a gift which makes you feel good , whether it is a book by your favorite author or tickets to your dream destination or a clothing in your color and style, that is the best gift! Buying clothing as a gift can be mind boggling. There are thousands of items and brands and variations of each of them to choose from. You should know the person’s exact size, style preference, color preference, then also there are chances that he/she may not like it. 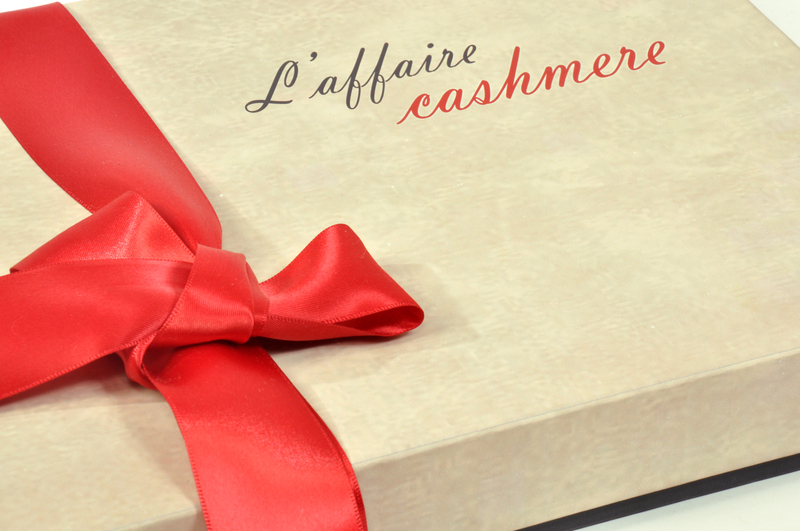 Least risky amongst the clothing is buying cashmere scarves and shawls as gifts. They make a luxurious gift in all seasons for women/men of all sizes and ages. You should just know their color preference or gift a basic neutral color. 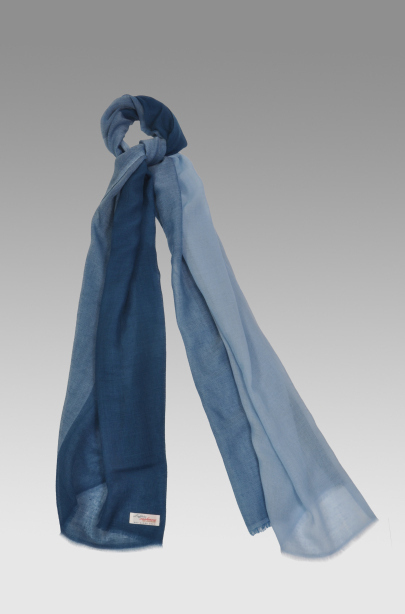 There are great online options for women’s scarves and shawls and stoles in pure cashmere. A beautiful Gift Packaging multiplies the joy of giving and receiving manifold! The magic of cashmere ‘kani’ shawl! 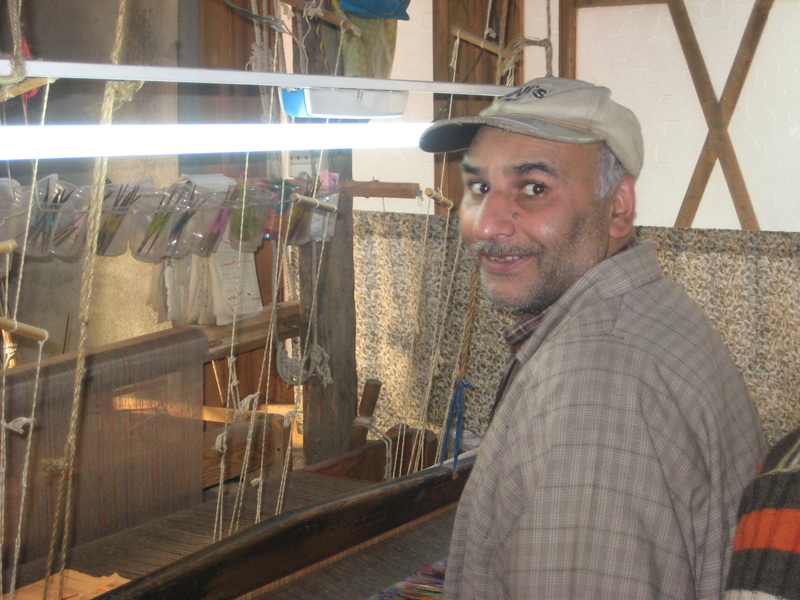 ‘Talim’ or the design and the corresponding instructions page for the workman to follow..
On our recent sourcing trip to Kashmir, we capture in this video the mesmerizing art of weaving the beautiful and awesome art of ‘kani’ on a cashmere shawl. 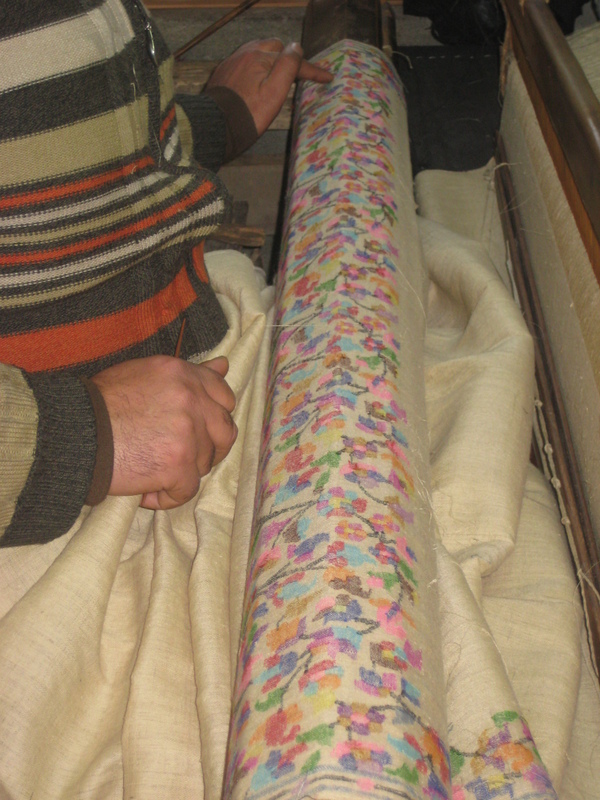 This tradition of weaving floral motifs on bobbins has been preserved over the centuries and is quite a work of craftsmanship and patience….it takes a weaver approx. one week to complete one inch of floral design! Arranging the ‘kanis’ or the bobbins for the job..
the proud and hard working skilled ‘kani’ craftsman..! Two ‘karigars’ or the craftsmen work in unison to weave the motifs of love and life…! In an anonymous text of 1875, it is written that “the transparent veil worn by the Mona Lisa is in reality on of those earlier Kashmeer fabrics that could be drawn through a lady’s ring as a test of its fineness”. It could actually be a cashmere shawl or even a Dhaka muslin. The so called ‘ring shawls’ are actually not all that rare. Any fine and loosely woven cashmere shawl/scarf can be pulled through the average wedding ring. The ring test, by the way, as proof of fineness and delicacy of a material is not peculiar to Kashmir. It is applied to the shawls of Shetand, Russian Orenburg shawls and the same test traditionally is used for the fine textiles in Malaysia and Indonesia! discovering myself before coming a full circle!